Space Hulk Deathwing Enhanced Edition is a game which sadly isn’t nearly as exciting as its name is long. As a first-person shooter, you trundle endlessly down dark corridors, mindlessly cutting through hordes of enemies. If that sounds tedious, dull and repetitive, then I almost feel bad telling you that Space Hulk Deathwing Enhanced Edition is also riddled with game crashes, save corrupting bugs and has virtually no checkpoints. Warhammer is having something of a golden age in games at the minute. Vermintide is utilizing interesting settings and character design to great effect while Total War: Warhammer is making bold strides in the strategy genre. There are countless other games with varying degrees of success using the license as well, then there is Space Hulk. Warhammer 40K was always the more popular choice amongst my friends when we briefly started playing the tabletop miniature game. Personally, I preferred the high fantasy variant (Wood Elves forever!) and I feel Space Hulk personifies every issue I had with the sci-fi universe. 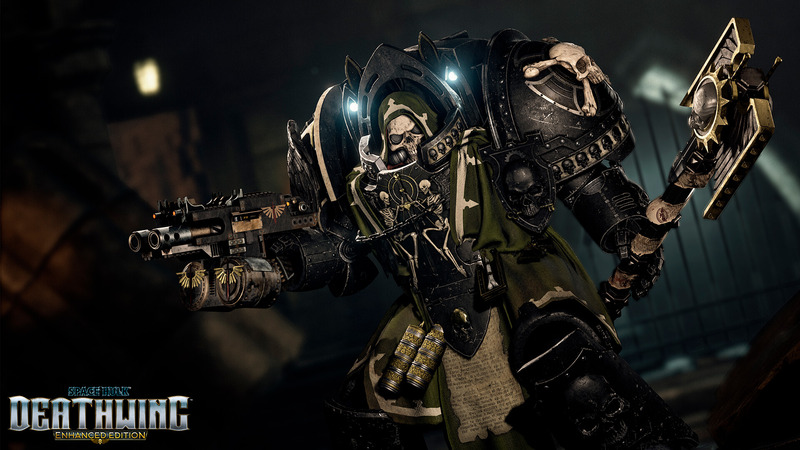 From the very beginning, Space Hulk Deathwing Enhanced Edition throws countless buzzwords at you, all meant to sound powerful and important, but mostly just ending in ‘-ium’ for some reason. It felt like a dubious businessman trying to sell me some genuine ancient Roman real estate and was laying it on way too thick. Behind the impossible to decipher wall was meant to be a military-style briefing about an upcoming mission, but with no context what so ever. If you don’t know the apparently many branches of whatever variety of space marine military here, you’re out of luck. It’s immediately off-putting and the game hadn’t even started yet. But when you take command of this hulking armored soldier of death, there is a glimmer of hope. The armor feels suitably heaving and imposing, with a slow turning circle and heavy, metallic footsteps. For a moment you can feel yourself in this role, sent to establish a beachhead in an ancient amalgamation of spaceships that houses the alluring McGuffin. Here the structure before you is dark and foreboding, its clanking industrial façade uncomfortably smashed together with something older and more eldritch. This moment of setting and pace, as you explore its silent mazelike corridors and templelike rooms feels genuine, but then rather unceremoniously the combat begins and that sense of dread quickly dissipates. A gaggle of unimaginative pinkish monstrosities crawls out from some previously eerie dark place and straight into your crosshairs. While they might surround you, they don’t impose a threat. In fact, several hours in and I’m still not entirely sure what constitutes the health bar. There’s a Fallout styled body map that sounds nebulous and seems to have no bearing on gunplay or movement, and at some point, if you get hit enough you die. Anyway, the enemies arrive in two states, hectic hordes or stragglers, and neither is interesting. Hordes are impossible to miss, and you spend most of your time stepping back and firing. Stranglers offer no threat and can be dispatched in one or two bursts. There are a few different enemy types but none will surprise you. Some explode at close range while some have ranged attacks, as usual in these games. And in the middle of a chaotic encounter, they’re hard to tell apart. For the most part, the game trudges along and I found myself relentlessly marching toward the objective, disregarding enemies as they spawned inside passages and dead ends. And that’s because, for some reason, Space Hulk is a team based first person shooter. While I led us down endless corridors, to comrades marched behind me, shooting at everything that moved. I only ever needed to engage in big clusters and even then I could quickly escape to the continue on my walk. There are a few weapons and magic spells to select from but none do a good enough job of substantially livening up the proceedings. And despite its enhanced moniker, Deathwing does not look the part. While the design of the environment has its moments, the graphics are rather poor. Very poor. On top of that, with more than a few enemies on screen (and sometimes even with none at all) the frame rate just bottoms out. I honestly don’t know what the intention of the designers was when imagining this combat. Warhammer 40K for me has always been about intense battles of huge hulking forces smashing against each other but you just don’t get that impression in Space Hulk Deathwing Enhanced Edition. The enemies don’t have any real sense of danger to them, and you rarely feel any challenge. You are a tank that can survive nearly anything the enemies can throw at you, which sounds empowering until you actually play it. Then it’s just underwhelming. On top of that, I had to play the opening level three times because of game crashing bugs that sent me back to the start, so I can confirm without a shadow of a doubt that there is no replay value in the game. For a moment I thought that Space Hulk Deathwing Enhanced Edition might have something interesting planned. I thought it might feature huge weapons and larger than life enemies, but in the end, it turned out to be funnier to say than to play it. Sadly, not much has been improved at all compared to the original launch. Reviewed on PlayStation 4 (code provided by the publisher). You can purchase the game via Amazon. Space Hulk Deathwing Enhanced Edition doesn’t feel enhanced. The gunplay and enemies are boring, the story isn’t interesting and the crashes (on PlayStation 4) are very frustrating.